The Merced table top sketch box table easel is a complete portable studio on-the-go. 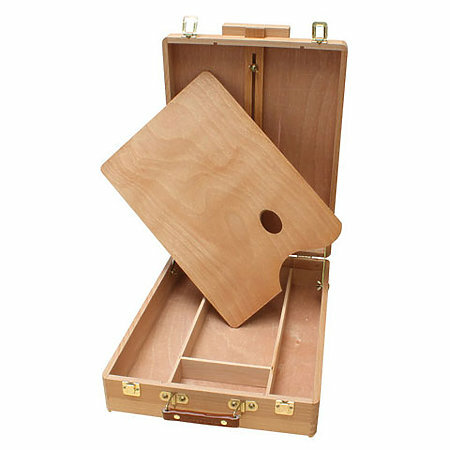 Made of hand-sanded beechwood and finished with brass hardware, it features a spacious, locking interior storage compartment with removable dividers, a wooden palette, rubber feet on both bottom edges for stability and to prevent sliding and a comfortable carrying handle. Easel incline can be adjusted from horizontal to fully vertical and any angle in between. Accommodates canvases up to 27" and folds to a compact portable size of 13"w x 18"l x 4"h. It can also be used to transport wet canvases! Fully assembled. Instructions for use can be downloaded here.